Josef Casimir Hofmann. Polish born American pianist and composer. Photograph signed, "Compliments of Josef Hofmann, London, 1938". Approx 10 x 7.75 inches (25.5 x 19.5 cms). Slight mounting traces to top edge of verso, else in fine condition. 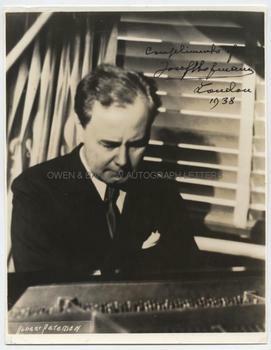 A nice image of the virtuoso pianist looking down at his piano with an expression of rapt concentration. Josef Hofmann was an unprecedented musical prodigy, touring Europe and America as a child until concerns about his fragile health forbade it. He went on to become one of the very greatest concert pianists of all time until alcoholism began to take hold of him in the 1930s. Sergei Rachmaninoff declared him to be "the greatest pianist alive if sober". His disintegration as an artist was described as "one of the terrible tragedies of music". Josef Hofmann was also an inventor of extraordinary diversity. Among the 70 patents that he held were designs for shock absorbers, windscreen wipers, oil burning furnaces and improved piano actions. Josef Hofmann died of pneumonia in Los Angeles beset with marital problems and alcoholism and having lost all interest in his musical performance.